Orange is the new frittata with this sweet potato breakfast. Sweet potatoes have bumped out white potatoes so many times this past year, and the latest rage is this sweet potato breakfast frittata. I added in sage sausage because it’s Autumn, but you could use bacon, or no meat. You may not realize that the sweet potato is one of the best things you can eat in the morning because it’s filling, a complex carb that gives you energy, good taste and satisfaction. It finds its way into my egg dishes several times a week. I love the color, and the contrast of sweet and savory because a sweet potato loves sea salt and pepper. Forget all the sugar and cinnamon that most people throw all over this perfectly gorgeous food that is still affordable (even organic) and super nutritious. I browned sage leaves from my garden and stuck them in the frittata before I baked it. 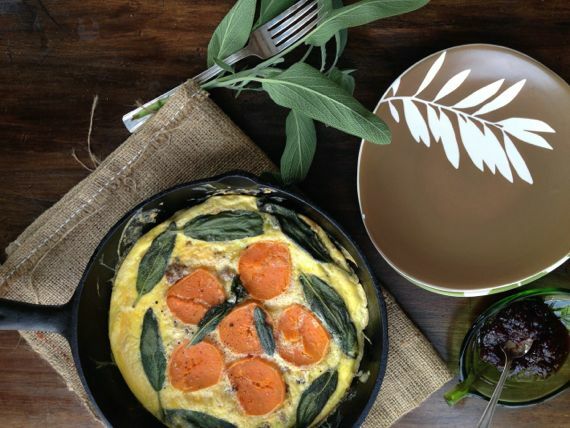 Who knew how good sage could be when partnered with sweet potatoes in a breakfast frittata. I say breakfast, but wouldn’t this be just as good for dinner? While orange is the New Frittata, Green is the new Spinach Tiger. Over these past six years, this blog has become part of my identity, and major way I connect with the world, share who I am. It’s helped to set me free, unleash the things low confidence tends to hold back. I was an exceedingly shy child and I desperately needed a Taylor Swift to help me shake off massive insecurities, stemming from chaotic parents. They were the people I was always covering for, trying to hide the things they did. It took two years to get the logo because I had design block. I resisted the color green. Once I gave into what made sense, it only took two days. I learned so much about the power of brainstorming. The process took over 24 renovations with input from several people. Each opinion helped to shape it in the right direction. I owe Mr. Spinach Tiger the most, because he “gets me” and had the most say. When he gave final approval, I knew I was finished. I used PicMonkey, a free on-line editor, and most of you know how great it is. But, what’s hard about a logo is not the software you use; it’s defining who you are. That’s got to be clear, and I’ll talk about that soon. I’m still working on a new tag line, and the social media buttons will move up next to the logo. There will be some other cosmetic changes, but what will remain the same is the content of Spinach Tiger. I will always bring you nutritious, delicious, beautiful food that breaks down the barrier of the sexes, (healthy and hearty) lots of fresh vegetables and well prepared meats with some desserts made from scratch. I will continue to post about restaurants, especially in the Nashville area, and at times some interesting things about this town that tourists would enjoy. I recently wrote Nashville’s Bucket List for the Nashville Arts & Entertainment Magazine, so I have some cool ideas about what to do. Due to space constraints about 20 things were left out and Nashville is so much fun, there are truly hundreds of things to do, so please email me if you need ideas. 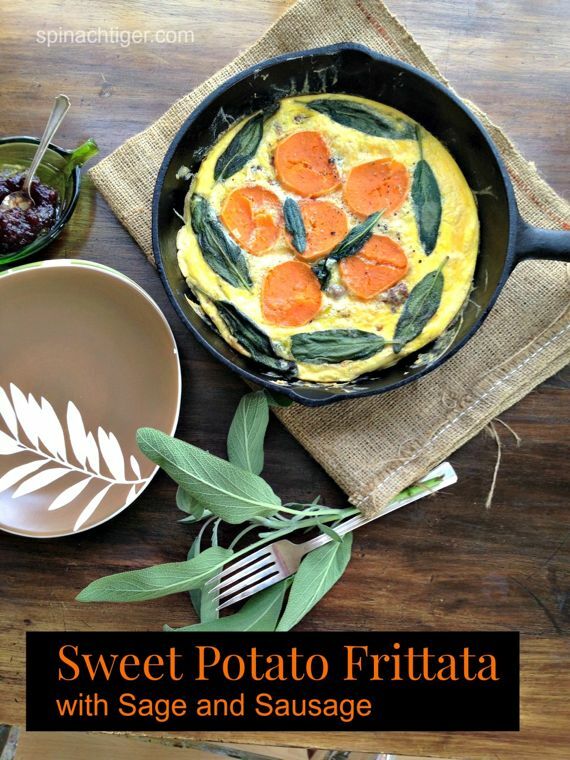 In the meantime, enjoy this delicious, nutritious sweet potato breakfast frittata. Here are a bunch of egg recipes that you might like and one very nice sweet potato lasagna. Loving the new logo Angela!! And isn’t it nerve wracking when something goes wrong with your blog? I know… I’ve been there.. 🙂 I use the foodie theme on my travel blog (papertravels.com) which is obviously not a food blog but I still like the flexibility of the theme and I just think it looks good, so I’m sure you’re gonna nail it. This frittata looks pretty awesome too. Sweet potatoes are my favorite too! Thanks Simone. I love your new look too. I often admire your blog and your photos. Thanks Teresa. BTW, sometimes I can’t leave a comments on your website and I like to.